The Formax FD 8806CC Cross Cut and 8806SC Strip Cut are among the most advanced high volume industrial shredders available. 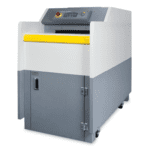 These high-capacity conveyor-fed shredders combine fully-automated features with the rugged, industrial strength needed for high volume centralized shredding. Standard features include an LED control panel with load indicator which provides immediate feedback to the operator, maximizing efficiency and minimizing jams. The continuous-duty motor, all-metal gearing and heat-treated solid steel cutting blades provide the power to shred up to 90 sheets (CC) or 110 sheets (SC) in one pass, as well as entire files, stacks of computer forms, cardboard, CDs and magnetic discs. User-friendly features include Auto Start/Stop, Auto Reverse, and Auto Cleaning, rugged plastic waste bin on casters, a large safety stop bar, and key lock. The EvenFlow™ Automatic Oiling System is another standard feature, which lubricates the all-steel cutting blades, helping to keep the FD 8806CC and 8806SC in peak operating condition. Key FeaturesHigh-capacity industrial. Conveyor fed. Cross cut / Strip cut. LED Control Panel. Shred entire files & more. Automatic Oiling System.